Slots are immensely popular among online casino players so it is hardly surprising they constitute a substantial part of the gaming collections of all established web-based casino operators. What contributes to their success among players is their very simplicity. Practically anyone can learn the rules, play and potentially end their betting session by winning a hefty prize. Online casino operators offer an impressive range of slot titles and variations. Each game has its distinct features, theme and story, so often new players are overwhelmed by the sheer scope of the options they are provided with. The vivid graphics, engaging animations and great sound effects further contribute to the entertainment value of slots. As there are literally thousands of online slots to choose from, novices who have never played before are often confused and experience difficulties in deciding which games to place their bets on. There is one very important thing to take into consideration before you start playing slots for real money. The easier a given game is to play, the worse odds it typically offers. This applies in full force to slots as well. Below, you will find a few criteria to consider prior to joining the fun online slots can offer. If you stick to these criteria and choose the slots you play wisely, you will be able to maximise your profits. With thousands of options to choose from, players should remember not all slots are created equal. When choosing an online slot to play for real money, the first thing you need to check is the game’s Return to Player percentage or RTP. The RTP denotes the long-term expected payout percentages from all bets made on a given casino game, be it a slot, a blackjack or a roulette variation. For example, if a given slot is said to have a theoretical RTP of 95%, this would mean players can expect a return of £950 in profits from every £1,000 they have wagered. Knowing the RTP is crucial when you select a slot. Needless to say, it would be better if you pick a slot with a house edge of 3% or 4% as compared to games with a 10% built-in house advantage. Volatility is another term new players should become well acquainted with. Volatility (also known as variance) reflects how often and how much players can expect to win during any given betting session. High-volatility slots are the ones that offer more substantial payouts which occur less frequently. In comparison, with low-volatility slots, players hit the winning combinations more frequently, yet the payouts are much smaller. Which of the two types you choose, depends solely on your bankroll size. Playing high-volatility slots requires patience and is suitable for players with bigger bankrolls, who are content with not seeing lots of action. If you have sufficient funds, eventually you will hit the lucrative combination that will replenish your bankroll. Low-volatility slots are recommended for players with smaller bankrolls, who enjoy more action and are satisfied with collecting more frequent, though smaller payouts. The only way to determine the volatility of a given slot is through playing it. But do not worry – you are not required to always play for real money. Most online slots are available in Fun or Practice mode. You can play a game free of charge to test it and decide whether it suits you or not. Another important criterion to consider when choosing a slot is the number of paylines it features. 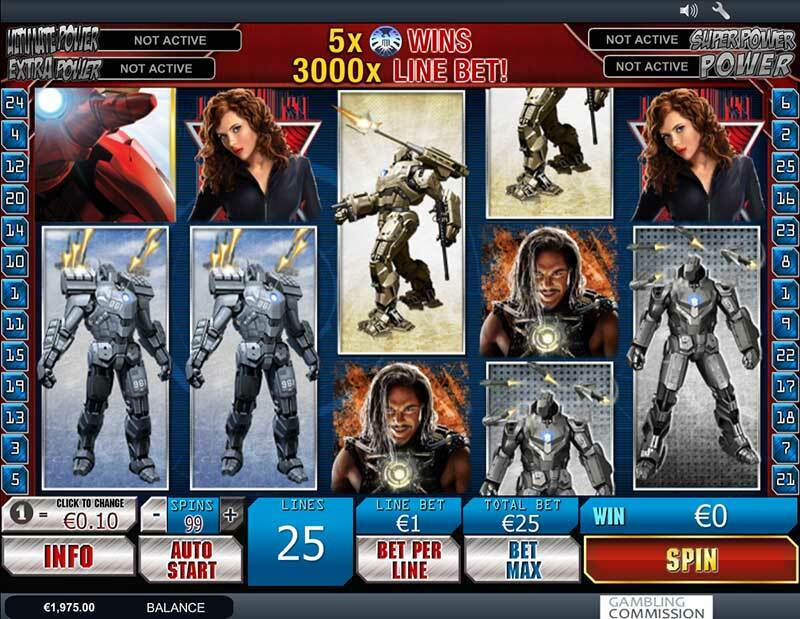 Paylines are among the most fundamental features of online video slots. Their number determines the number of winning combinations on a given slot. Many experienced players advise novices to look for slots with multiple paylines. There are slots with fixed paylines which means players are required to bet on every single payline available. Then again, there are slot variations which allow players to make adjustments and decide which lines they wish to activate and play on. Each line counts as a separate bet, which means if you have selected a slot with 25 paylines and your coin value is £0,10, each spin of the reel will cost you the sum of £2.50. How you play the paylines is also important. Players can potentially collect a payout only on lines that are active. If you activate only 10 out of 25 paylines and the winning combination falls on a line that is deactivated, you will not turn a profit. Generally, it is recommended to play all paylines on every spin, even if that means playing with a smaller coin value. If you fail to do so, you might end up missing on a hefty prize. 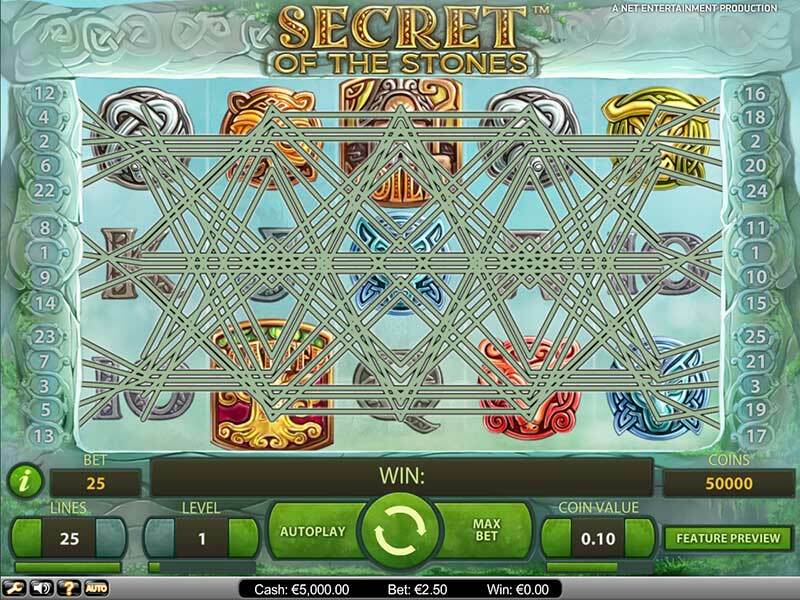 NetEnt’s Secret of the Stone slot with 25 paylines and coin value of £0,10. Each spin of the reel will cost the Player the sum of £2.50. Many slot fans prefer to play progressive slots which have a huge jackpot attached to them. The jackpot increases incrementally, which means a small portion of all wagers goes towards the pot. Naturally, this causes the jackpots to skyrocket to millions of pounds on many occasions. However, players are required to bet the maximum amount allowed on the progressive slot in order to become eligible for the massive prize. Also, progressive slots often offer fewer and smaller regular wins to balance out the possibility of someone hitting the jackpot. That is why it is advisable to play the progressives whenever the pot has escalated to a life-changing amount of money. You can keep an eye on the jackpot metres of all progressive slots to see how big the prizes are at any given moment. Also, we recommend players to opt for progressives which have low to medium volatility. Popular progressive slots that fall within this category include Thunderstruck II by Microgaming (96.65% RTP), Iron Man 2 with 25 paylines by Playtech (95.98% RTP) and Mega Fortune by NetEnt (96.60% RTP). One of the biggest advantages of playing online results from the fact web-based casino operators offer an abundance of bonuses and promotional offers to both new and existing players. Many reputable gambling operators offer a given number of Free Spins on selected video slots on a regular basis. This provides inexperienced players with the opportunity to potentially generate profits without risking any of their funds. So, it is always a good idea to keep track of the Free Spins offers available and claim the bonus rounds on slots that are eligible for this offer. Newly registered players are greeted with Welcome Bonuses upon their first deposit at an online casino. For example, if you deposit £100 and claim a 100% Welcome Bonus, you will be granted the additional sum of £100 to play with free of charge. This is yet another way to enjoy some quality time playing the hottest slots on offer without risking your own money. Existing players, on the other hand, are rewarded for their loyalty with Reload Bonuses each time they fund their accounts, using a specific payment solution. In most cases, the percentage of such bonuses varies between 5% and 15% of the deposited sum, depending on the payment method used. However, before you claim your Free Spins on a given slot or opt in for a specific bonus, it is strongly recommended to read the online casino’s terms and conditions page. Usually, such promotional offers have wagering requirements attached to them, which should be met before players attempt to withdraw the winnings they have accrued with the bonus credits. Another way to boost your bankroll and play the slots without risking your funds is by taking advantage of the so-called Comp Points. Each money wager you make on the slots earns you a specific number of Comp Points. The points can be exchanged for more bonus credits or even for cash on some occasions. Many advanced video slots boast a number of special features which can render players’ betting session even more lucrative. These special features are typically listed in the paytable, so make sure you always check them before you make a bet on any given slot. Many online slots contain bonus symbols which, when hit, can trigger mini in-games. These vary greatly from one title to another. Some bonus games require players to choose from different options in order to win additional prizes. 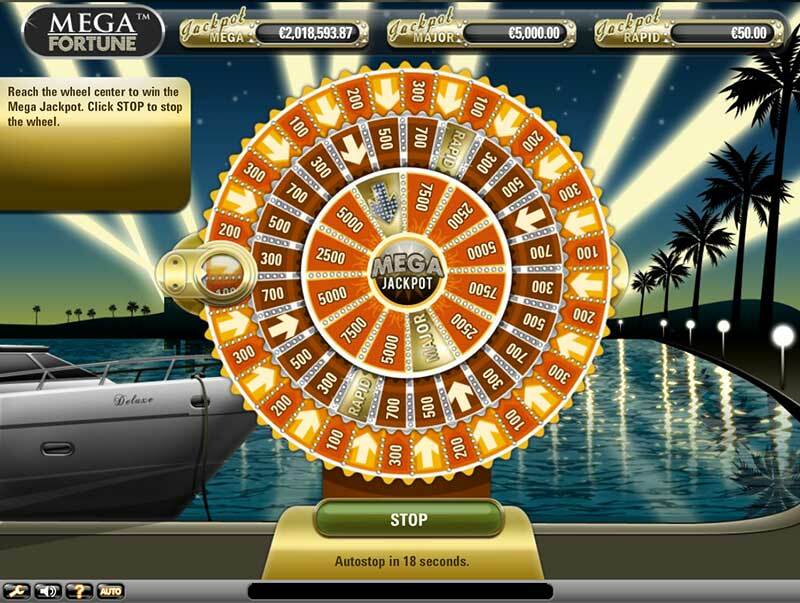 Others, like the Mega Fortune slot, give players the chance to pocket a bigger prize by spinning a wheel. Players should also consider engaging in slots which have the scatter symbols feature. Whenever three or more scatter symbols appear on the reels after a spin, they trigger a round of free spins. The latter multiply the payouts on winning combinations one to five times. If two or more scatter symbols appear during a round of free spins, another multiplier or round of bonus spins is triggered. The wild symbols feature also enjoys a tremendous popularity among slot fans as they improve their chances of winning. These symbols function the same way wild cards in card games do. In other words, wild symbols act as substitutes for missing symbols that players need in order to complete a winning combination on the reels. There are all kinds of wild symbols, including expanding/spreading, stacked, sticky, and shifting wilds. Each one of these can boost players’ profits. Slots with multiplier symbols are exceedingly popular among fans of this game. Such symbols have the potential to multiply players’ profits by a specific amount. Multipliers can range between 2x and 1,000x your winnings, but it all depends on the slot you have chosen. Some multipliers are unlocked by scatter symbols while others function only as an inseparable part of a given bonus game. Though less important than the aforementioned criteria, visual appeal also should not be underestimated. It is recommendable to opt for slots which have been developed by leading gambling software suppliers, the likes of NetEnt, Microgaming, IGT, Playtech, and Betsoft, to mention a few of the most popular names in the industry. Such slots not only boast a variety of handy features, but impress when it comes to design. The visuals are typically exceptionally vivid and life-like, while the great sound effects and sleek animations will hold your attention for a long time, rendering your gaming session even more entertaining. Often, when a winning combination is spun, the symbols on the screen come to life as they are artfully animated. Some software suppliers cater to the needs and preferences of players by offering slots that are inspired by popular movies, TV and comic series. These slots are not only impressive in terms of graphics and sound effects, but boast more complex storylines. An example would be Microgaming’s Battlestar Galactica slot where achievements enable players to move through three different ranks, namely civilian, colonel and admiral. Another example is NetEnt’s Aliens slot, based on the popular blockbuster where players can advance through three levels – the Search, the Encounter and the Hive. Last but not least, online gambling operators which run on software developed by leading suppliers, like the ones mentioned above, are often highly regarded for their reliability, fairness to players and transparency. So, always make sure you check whether a given casino is licensed and which software suppliers have developed the slots on its portfolio.